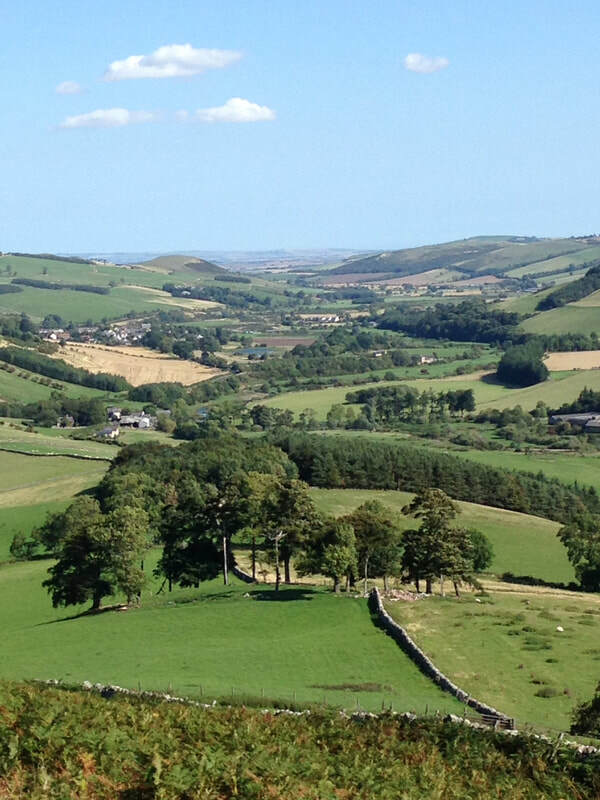 View from the top of Staerough, the hill which looks over Yetholm, looking towards Halterburn. The twin communities of Kirk and Town Yetholm lie a mile inside Scotland, on either side of the River Bowmont. The Bowmont Valley runs deep into the surrounding Cheviot Hills. The nearest town is Kelso, which is seven miles distant. The area is rural, quiet and very beautiful. The western edge of the Cheviot Hills is comparatively little explored. You can spend hours walking in the surrounding hills without meeting anyone else. 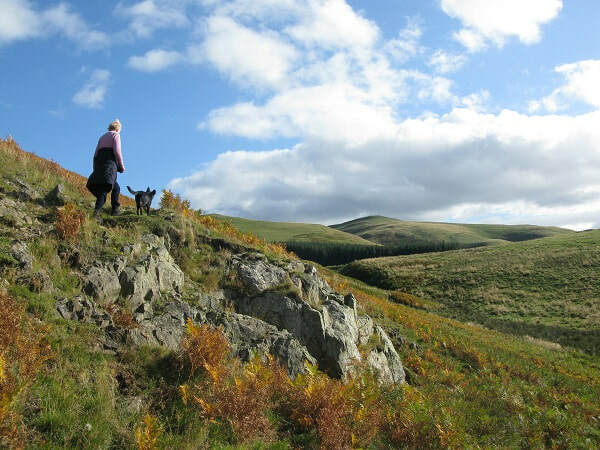 At the same time Yetholm offers an ideal base for exploring the wider Scottish Borders and north Northumberland. Holy Island and its surrounding empty beaches are easily reached from here, as is the rugged coastline of Berwickshire. To the west you can find the famous border abbeys, such as Dryburgh and Jedburgh, as well as numerous castles, stately homes and gardens. Walking along St Cuthbert's Way, as it leaves Yetholm for Wooler. Yetholm itself offers a variety of facilities and places of interest for those who wish to have a holiday without the stress of travelling hither and thither. There is a village shop, butchers, post office, garage, campsite, two pubs as well as a number of B&B's and self-catering cottages. Details of many of these businesses can be found on the Accommodation and Local Businesses pages of this website. Walkers find Yetholm makes an excellent base for a holiday. The area has almost forty public access routes suitable for gentle or more strenuous exercise. For those who prefer the former it only takes ten minutes to walk up from Kirk Yetholm and then down into the tranquil Halterburn valley. 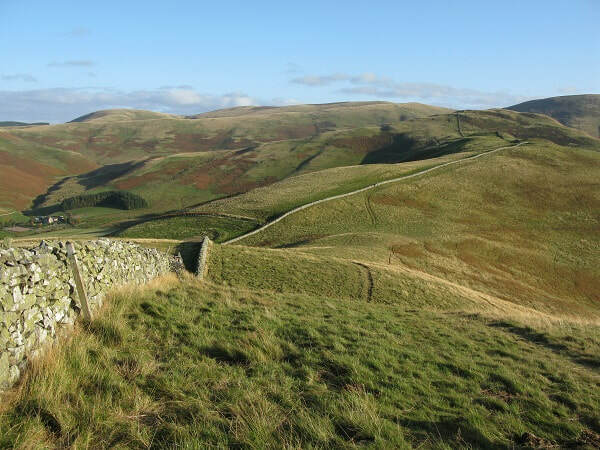 For those who want to spend the whole day out on the hills, there are several cross-country routes, which either pass through, or end within the village: the most notable being the St. Cuthbert's Way and the Pennine Way. Whilst the former passes through the village en route to Lindisfarne, the latter actually ends in Kirk Yetholm. A number of local walks have been described and published by Yetholm Community Council and they can be bought in the village shop, the Border Hotel and other local outlets. The surrounding hills are etched with traces of countless earlier generations - hillforts, field systems, abandoned farmsteads, stells (circular enclosures to protect sheep) and standing stones. The treeless hilltops themselves are also the product of human activity, beginning in the Neolithic period, though the result of this ancient deforestation is a stark and dramatic landscape that is not easily forgotten. The weather here in the east is colder and dryer than that found in western Scotland, but as long as you are well prepared it is easily possible to have a perfect day's walking in the area well into November. 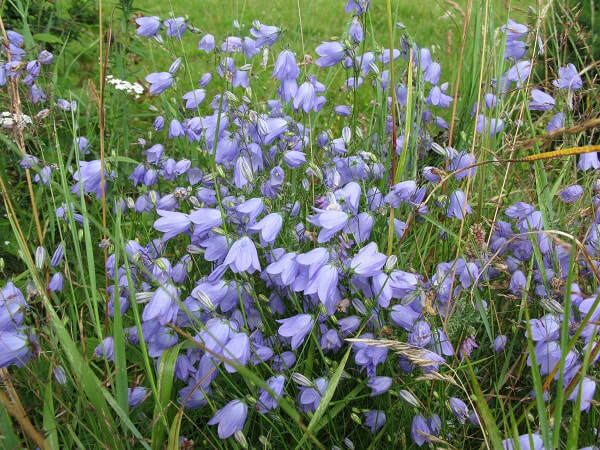 The vegetation changes with the seasons - harebells, heather, rowan - as do the birds - curlew (whaup), ring ouzel and swifts. For those interested in wildlife there is a nationally significant nature reserve at Yetholm Loch - home to otters and even the occasional osprey. A little further on, at Hoselaw Loch, can be found an important resting place for migrating ducks and geese such as pochards and greylag geese. 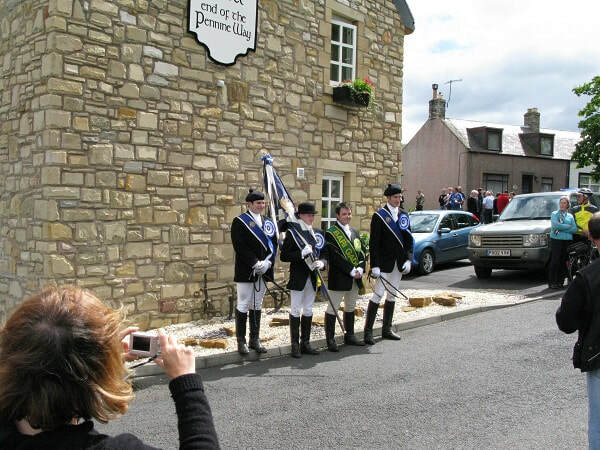 The Kelso Laddie is welcomed to Yetholm by the Bari Gadgi outside the Border Hotel. After a day walking in the hills, Yetholm has two welcoming pubs in which you can relax. It's also worth looking at the events page to see if anything else is happening in the village - the Wauchope Hall in Town Yetholm regularly hosts film shows, visits from theatre companies and dances. Prize-winners at the show and their cups! 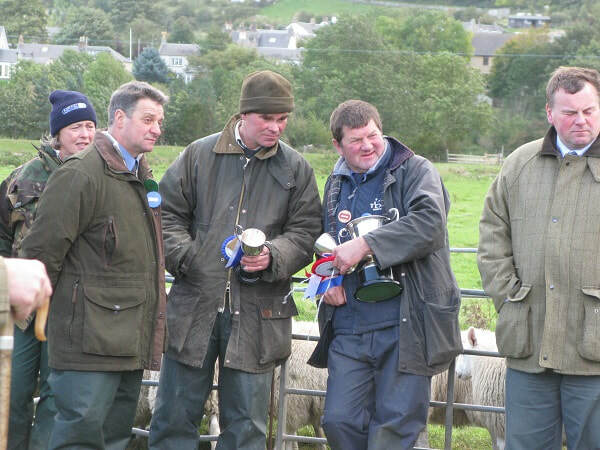 The second big annual occasion in Yetholm is the Border Shepherds Show, which takes place in early October. This is the penultimate village show in the region. It's a traditional event, with a history dating back almost 150 years, and includes a sheep dog trial, best-of-breed competitions, tractor displays, as well as the usual hotly contested baking competitions. For visitors it offers a chance to meet local people and experience something of the way of life in this rural area. Town and Kirk Yetholm from Wideopen Hill.